If you are making your first visit to us, we want you to be comfortable in knowing what to expect. Below are some commonly asked questions. If you have any other questions before coming to visit us, please don’t hesitate to call at (607) 748-1544. 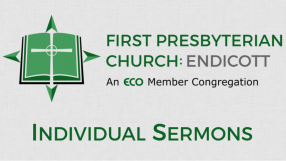 FPC:E is located at 29 Grant Avenue, on the corner of Grant and Monroe streets in Endicott, NY. You can find detailed schedule information and directions here. Because our campus has had several additions made, spanning different generations of time, one of the most confusing things about visiting us is where to park and then where to go. You have two main options: the lot on Monroe St. or the lot on Grant Ave. The Monroe St. lot is the larger lot, located on the corner of Monroe and McKinley. If you are arriving to the church from the highway, take a left at the first light (corner of Monroe and McKinley) and then take an immediate right into our parking lot. If you park here, you will be entering the church in the education wing. Enter the church through the glass door on your right as you come into the alley between our garage and the education building. Once you enter the building, go past the stairs and take a left. Follow that hallway down to our gathering area and someone can direct you to the sanctuary. The Grant Ave. lot is located right beside our main entrance doors. If you are arriving to the church from the highway, take a left at the first light (corner of Monroe and McKinley), turn right onto Grant Avenue, go just past the church, and take a right into the parking lot. If you park here, follow the sidewalk back to the front of the building you passed and enter through the glass double doors. You will be entering the gathering area just outside of our sanctuary. During both services we offer childcare for infants through age 5. This service is located in the Crib Room at the end of the 1st floor hallway of the Education Building. A map can be found here. Beginning at 10:30am, our Children’s Ministry program kicks off in the Kidzone. 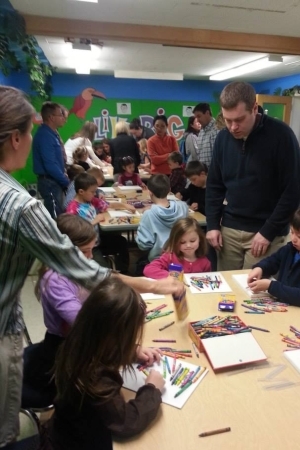 Children ages 3 through high school are encouraged to participate. Worship is an opportunity to honor God with our lips and our lives. Worship happens in a special way each time the community of faith gathers. It is also a time to renew our spirits and hearts, in order to go out and live in the world as disciples of Jesus Christ. Ultimately, we desire to learn how to deepen our participation in worship and carry that worship beyond that designated time on Sunday morning to include all our waking hours. 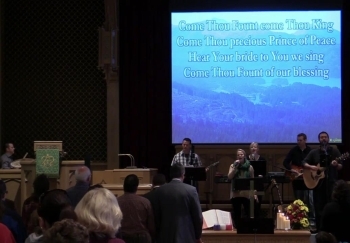 The 9:00 service is a contemporary style worship service. At this service there is an extended time of corporate singing led by a worship band, during which people are invited to worship God in the way that is most comfortable to each person. This may include standing or sitting, clapping or lifting your hands, or simply offering praise in the quiet of your heart. All are acceptable forms of worship. The Word of God is proclaimed through a variety of ways including sermons, people sharing their faith, or the use of technology such as film clips and original video clips. There is a children’s time near the beginning of the service. Dress is casual yet respectful. The 10:45 service is a traditional style worship service. This service is rich in the meaningful traditions of Reformed worship and also incorporates some blended elements from contemporary and other styles of worship. Liturgy and prayers, music, Scripture, media elements, and sermon are all woven together to form an integrated service. Worship is enriched by the Chancel Choir, as well as special offerings by the Mary El Bell Ringers, “A Touch of Brass” and other instrumentalists, musical and dramatic presentations by the children, etc. Dress at this service varies from casual to business. When you visit, don’t forget to introduce yourself. We have greeters at the doors, friendly members, and staff that would love to meet you and your family, and answer any questions you may have. Don’t be shy!